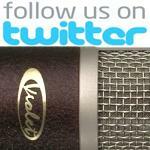 Would you like get one of the best selling microphone of Violet Design for free? - This is your big chance! All you have to do is to become a follower of Violet Design Twitter account www.twitter.com/violetdesignmic and retweet a message of the contest and you will become the one who can win a new Wedge microphone. You will have a chance not only win a microphone, but also receive daily news from Violet Design company about microphones, studio gears and different other things from recording industry. Our target is to collect 300 followers and then we will announce one winner of the Wedge microphone and other two who will be honored with 50% discount for any microphone from Violet Design range.